A square in the centre of Brussels has been named after Jo Cox, the Labour MP who was murdered two years ago. The square is near the Ancienne Belgique concert venue that Mrs Cox attended when she lived in Belgium. The naming ceremony was led by the Mayor of Brussels and attended by members of Mrs Cox's family and Labour leader Jeremy Corbyn. Mrs Cox, 41, was killed in 2016 by right-wing extremist Thomas Mair, in Birstall, West Yorkshire. She lived in Belgium for six years before being elected to Parliament to represent the Batley and Spen constituency in 2015. Mr Corbyn thanked the people of Brussels for the "truly wonderful gesture" to honour mother-of-two who was "so cruelly killed, so young, in such a brutal way". He told a crowd of friends and relatives in Place Jo Cox: "She always gave this message that we have far more in common that unites us than can ever possibly divide us." Shaking hands with Mrs Cox's sister Kim Leadbeater and parents Gordon and Jean Leadbeater, he ended his speech by saying: "In her memory let's build that better world. We can change the world, thank you." Mrs Leadbeater said the family was "honoured that the city of Brussels has chosen to remember Jo in this way" but voiced concerns that little political progress had been made since her death. "I think a lot of people hoped that the violent assassination of a young mother of two small children on the streets where she grew up would have a profound and long-lasting effect on the political discourse in the UK and beyond. "However, over two years after, and despite many people working extremely hard to show that Jo's murder was not in vain, I'm sadly not at all sure that this was the case. "As well as being a celebration of Jo's life, I feel that today is also an opportune time to reflect on this." 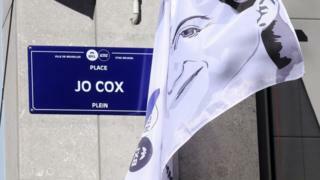 Mrs Cox was included by the city of Brussels on a list of "illustrious women" who will have squares, streets and buildings named after them as part of the city's plans for female and male equality.